This Made in the USA natural deodorant delivers more than just odor protection. It’s infused with magnesium—an essential mineral most of us don’t get enough of—that can help boost overall wellness, from energy to sleep, and can help benefit heart, muscle, and lung health. Dimensions: 4.75" x 1.5" x 1.5"
I guess I got used to the bumps and irritation that I got with drugstore deodorants. My underarms are clear and happy! 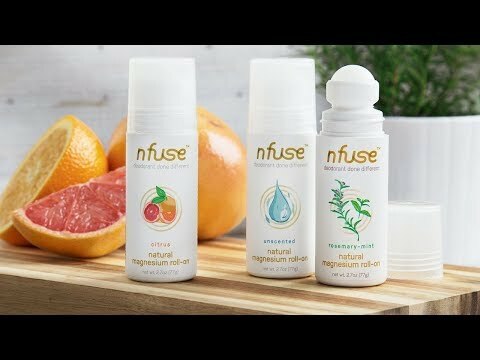 nfuse is a natural deodorant that does more than provide odor protection without any aluminum, parabens, and preservatives. It delivers a dose of magnesium that can help make you feel (and smell) great at the same time. You might wonder why magnesium is so important. The essential mineral can help benefit overall wellness, from sleep to energy, and can help positively impact areas like heart, muscle, and lung health. But about half of us miss out on getting enough magnesium in our diets. 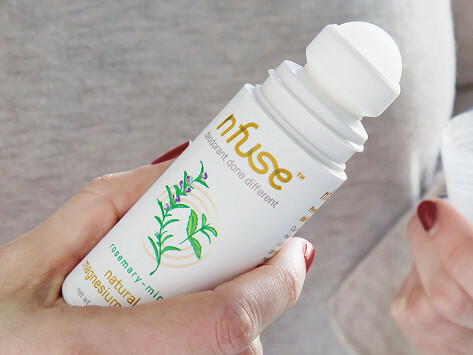 With nfuse, your body gets a daily dose straight through the armpit, which is—fun fact—a prime absorption spot. Sisters and Co-founders Emily Zollinger and Ann Ahl both took magnesium supplements and were feeling the healthy benefits, but wondered if there was an easier way to incorporate the mineral in a daily routine. While traveling in South America, they learned that milk of magnesia is used as deodorant there—and they each had the same lightbulb moment.